look at the crab roe sharksfin soup (top photo), a perennial favourite of ours at majestic. it was still so good! one of the very best soup i had, so sweet & tasty. majestic does a mother’s day ala carte buffet lunch at S$68pax++ with 15% citibank discounts. we came early at about 12pm. restaurant was full by 1230pm. i did not find a recent post on majestic on my blog. perhaps i did not record. 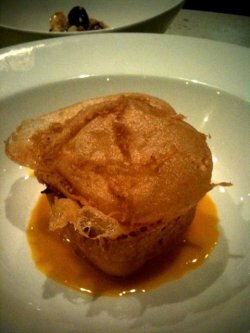 the one i had was 3 years ago, a world gourmet summit dinner in apr2013. for today, there was a self service station. the roasts were excellent! roast duck was especially good. we had a few individual helpings. char siew was good. 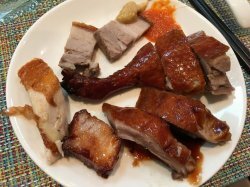 siew yoke ok not as good as the usual cube roast pork servings in these kind of good restaurants. 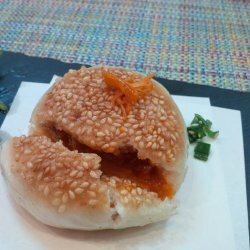 the lotus bun was good. we shared one among 5 of us. i took the braised duck wing. the pumpkin with 肉松was non descript for me. wife liked it though. i wanted to try the porridge. took a tiny bit. it was good! the braised belly pork was very flavourful. texture was tender though it didn’t look it in the large serving claypot. 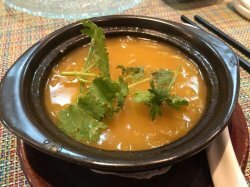 the crab roe sharksfin soup was limited to one serving each. top draw stuff! 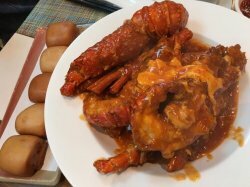 the chilli lobster was so so for me. chilli gravy was good especially with the bun which was excellent. lobster meat was not bouncy. did not feel like live or fresh lobster. the thai lemongrass chilli lobster i had recently at red house was far, far better. wasabi prawns were very good. tops! did not look it though with too much of the green mayo. but the batter was very good, not like most places where they were thick, hard, tough. prawns were very fresh, water melon a great balance, counterpoint. 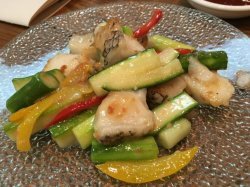 i love chilean seabass, & majestic served very good steamed ones in their regular menu. here it was non descript. the galbi style beef ribs were ok.
somehow it works better when served in individual small portion courses. the sharksfin soup was limited to one order. there were like 3 or 4 other soups unlimited orders. 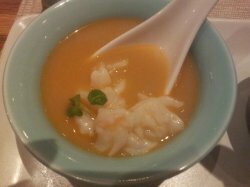 we ordered 2 lobster crab roe broth to share. a pretty good soup, though no comparison with the crab roe sharksfin soup. the spinach wolfberry was good. wife love the oyster mee sua. it was very tasty with nice oyster flavour. the salted egg custard buns流沙包 was very good here. 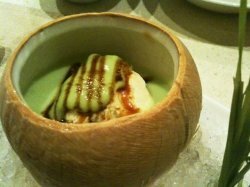 & the deepfried durian ice cream, another perennial favourite here. i ended up eating 1.5 portion. really enjoyable lunch & family time on mother’s day. 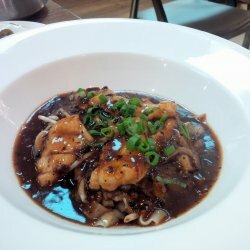 Majestic Restaurant is the award-winning modern Chinese restaurant owned by internationally-renowned chef Yong Bing Ngen. The interior is simple yet tranquil, with holes in the ceiling where one could watch swimmers wading by overhead, if they wish. 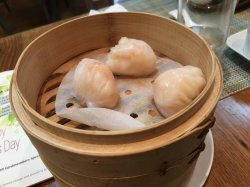 Service was excellent - attentive and polite; even though this was a Chinese fine-dining restaurant, it was utterly non-pretentious and very comfortable to be at. The Majestic trio platter was magnificent, and beautifully plated. Portions were dainty but very sufficient as appetisers; I did not know which one to start with. 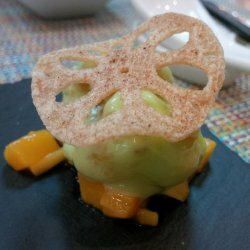 The Wasabi Prawns with deep-fried lotus chip. 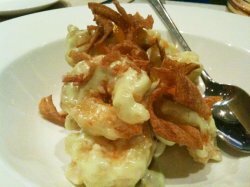 The plump, fresh prawns were luscious and springy, richly-coated with creamy wasabi sauce that lent it a hint of spiciness. 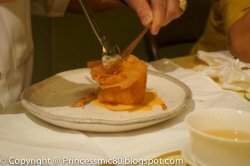 The lotus chip was crispy and sweet. 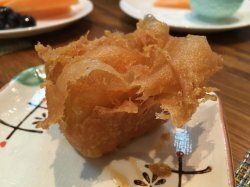 Chilli Crab Puff was sweet, crusty and filled with delicious chilli crab paste - a combination of saccharine gravy with hotness; it scored points on taste and texture totally. The Stewed Mee Sua with Oyster and Crab Roe for his mains. The mee sua was the most springy and smoothest I have ever come across - even the ones I'd tried in Taiwan could not top this; each individual strand was lifted easily without, and slid down the palate wonderfully infused with the delectable broth. The plump oysters were fresh - the tank itself is located somewhere near the kitchen - exploding in a burst of deliciousness in the mouth. The stewed Hor Fun with Sliced Fish in Black Bean Sauce for my main. Equally smooth was the hor-fun stripes, almost ready to slide into the throat. 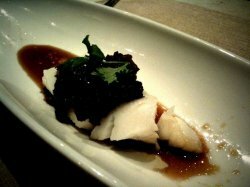 The black bean sauce was thick and strong, but not overly salty; the saccharine, flakey fish held a bounce in the texture that indicated its freshness. Majestic Restaurant is the award winning restaurant that features Cantonese cuisine by the internationally renowned award winning chef Yong Bing Ngen. 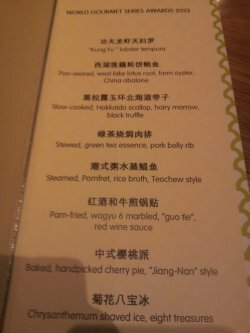 they served set meal for dinner at 68 bucks to 88 bucks ( per pax) or ala carte dishes for approx 10-20 bucks per dish. For our dinner this time, we ordered some of their dishes from their ala carte menu. and they are super good! Will i come again? Yes! and i will be back for more of their famous signature dishes! 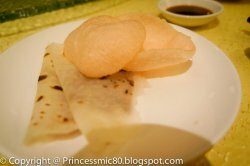 Their Peking Duck. 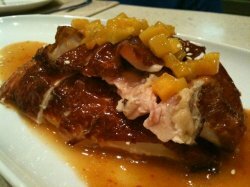 the skin is very crispy and i love their peking duck sauce! I discovered a new taste too, it taste superb with their chicken rice chilli sauce! love it! i love their chilli sauce! chicken soup is very refreshing for us. 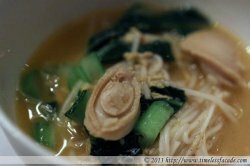 homemade toufu is very smooth and soft. I love it but its a pity that the toufu sauce taste a little bland. 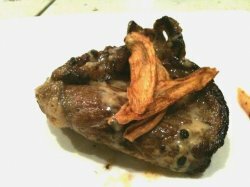 Kurobuta pork chop! i love this dish! the pork is a little fatty though but overall this dish is really good! 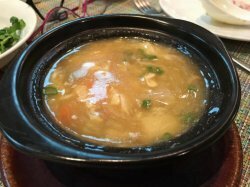 claypot chicken rice. I m so in love with this dish! their chicken rice is cooked in the claypot as in those hainanese chicken rice type! their chilli taste super gd with the chicken rice! i love it love it love it! Twas the weekend before Mother's day so we decided to beat the crowds (not to mention the ridiculously priced menus) and celebrate beforehand. A decision was made to try out Majestic Restaurant this year and honestly, my expectations were high as many people have raved about it. 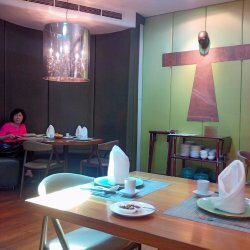 The place wasn't big and the interior leaned towards western influences rather than Chinese, with a huge open kitchen and booth seats. We had a corner booth to ourselves which was pretty nice and cosy although I must say that the air conditioning that evening was underwhelming. Wasabi Chips - Things got off to a good start with the wasabi chips - lightly salted, thin and crisp chips with a mild wasabi kick. Pretty addictive. Pan Seared Foie Gras - Served up on a slice of watermelon, the foie gras's crisp, well seared exterior belied a soft quivery composition whose sweetness was complemented by that of the watermelon. 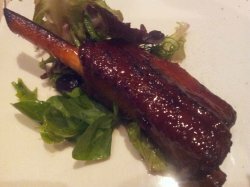 One of the best foie gras dishes I've ever eaten in a Chinese restaurant. 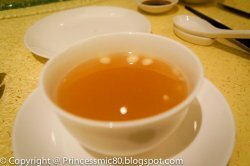 Double Boiled Sea Treasures with Superior Shark's Fin and Black Truffle - I thought that the soup was deliciously sweet yet light. It definitely helped that there was a plethora of ingredients, from baby abalone to sea cucumber, fish maw, dried scallops, chicken etc. 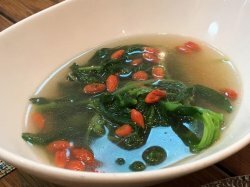 I'm usually not much of a soup person but this was one soup that had me yearning for more. One question though, where is the truffle taste? Deep Fried Brinjal with Pork Floss - I actually dislike brinjal but this dish was surprisingly quite palatable, with a crisp coating of flour and pork floss, very much like tempura. What I didn't quite take to was the oil content though. Scallops Wrapped with Bacon - Looks can be deceiving and the scallops wrapped with bacon was one prime example of that. The scallops were huge and the bacon looked like it had nice charred bits along the edges. Alas, the scallops weren't sweet and had a flour like texture whilst the bacon came across as soft and limp. Seriously seriously disappointing. 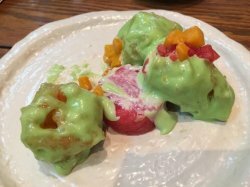 Salted Egg Yolk Prawn - A seemingly common dish in most Chinese restaurants these days, Majestic's variation came with slices of watermelon and chopped mango. The prawns were quite a size but I couldn't make out any taste or texture of egg yolk. Decent but there are probably loads of restaurants that do this dish better. Zhejiang Spare Ribs - This was another disappointing dish, with the meat coming across as too hard. But at least the zhejiang vinegar was nicely tart with a hint of sweetness. 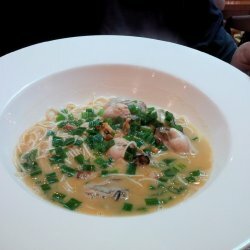 Signature Stewed Mee Sua with Baby Abalone - As much as I would like to understand the hype behind this signature dish, I am afraid I fail to comprehend. 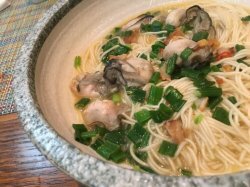 For starters, the baby abalone was, well, tiny and the soup base wasn't flavourful enough nor was the Mee Sua (面线) silky enough. Overall, a rather average dish in my humble opinion. 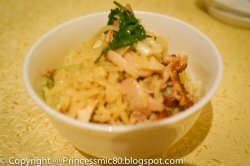 Signature Claypot Chicken Rice - Another signature dish from Majestic - the Claypot Chicken Rice. I can't say that I was wowed by it as it was evidently high class chicken rice. Sure, the rice was more fragrant than usual and less oily while the chicken was tender and reasonably plentiful. But seriously? 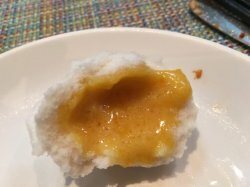 Durian Paste - We opted for the Mao Shan Wang (猫山王) durian paste to end off our meal and whilst rich, it didn't taste any different from eating straight out of the fruit as the gula melaka taste was non existent. Maybe I should have gone for the fried durian ice cream instead. One word. Overrated. Dinner was a case of more misses than hits and wasn't cheap by any yardstick, standing at about $577 for 6 pax ($96/pax). Service was very good but I don't think that justifies the high price tag and less than stellar quality of food. I am pretty sure with $96/pax, I can get seriously better food elsewhere. Also, the choice of music played in the restaurant is pretty weird. Why would you play English pop music in a Chinese restaurant? looked at Majestic’s 8-course WGS (World Gourmet Summit) dinner menu on its website & decided to go for this dinner. this 8-course WGS dinner menu is S$99++pax c/w several hundred $ for other WGS dinners & there is a 10% Citibank credit card discount. 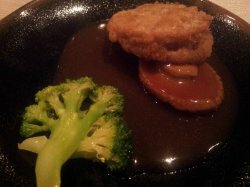 the abalone and lotus roots with a minced oyster filling in batter & brocoli in brown sauce was a superb dish. Chinese dried abalones in brown sauce are always soooo good. the abalone was smaller than the 5-head ones at Xin Cuisine, probably 8 or 10-heads but still good size. the lotus root with minced oyster though was par excellence, very good indeed! 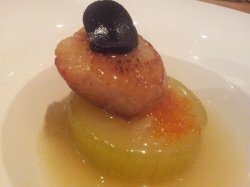 next item on the menu was plump, sweet,nicely seared hokkaido scallop sitting on a marrow gourd, and it had an amazingly large black truffle topping it! I love the fragrance truffle & truffle oil add to dishes (especially cold Japanese noodle topped with caviar & some truffle oil at Gordon Grill) but never believe in paying stratospheric prices for them. the 4th dish was 1 of the best caramelised pork rib I had. you can the glaze, glistening..not sure how it is done – whether baked or deep (or shallow) fried & braised. the plating was good with the green tea powder donning some chinese character (京?). 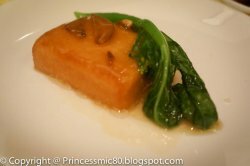 next was the teochew steamed promfet – as good as any good teochew restaurant, not sure the plating & pigskin topping (odd choice) was an effort in fine dining presentation? 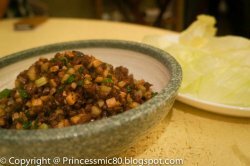 whatever – the taste still a good robust steamed teochew promfet dish. 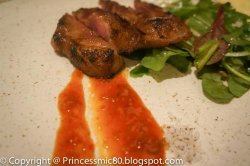 we were expecting panfried wagyu MBS6 – I guess maybe that was too much of an expectation for the price? haha. the 2 desserts were I guess another effort at creativity & fine dining.. don’t know what to make of the cherry pie thingy..the pastry was excellent, lovely swans too, the filling a bit sweet & not my thing, like a sticky date pudding? maybe. overall it was an outstanding & enjoyable dinner. the WGS menu promotion is until 26apr2013. The food is indeed Majestic! One of my favourite restaurants in Singapore, if only I my pocket allows me to indulge in this more often! Photographs speak a thousand words, so well, let me just showcase the photographs. All the dishes are very good, exquisite in taste and sight! One of the places that you should bring for a special birthday or celebration. I wish my grandmothers were alive, I would certainly bring them here! 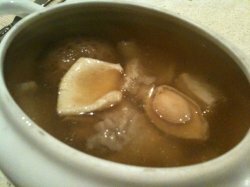 Delicious bowl of fish maw soup with abalone. Not surprise if this uses a pork bone soup simmered for ages. The lamb culet that i chose. 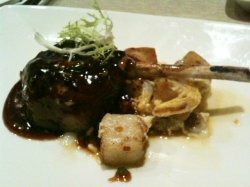 Lamb cutlet with carrot cake. I thought the sauce was too overpowering. Too strong and too sweet that it masks the original taste of the lamb. 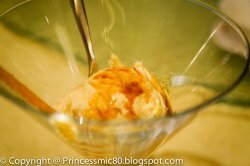 The wonderful heavenly fried durian ice cream. 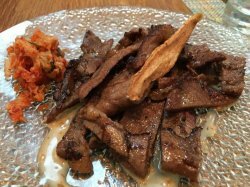 The beef was really thin but very tender, and although I’m not a kimchi fan, it surprisingly was very well-paired with the kimchi on the side, adding a slightly sour edge to the very rich taste of the beef.